For the sake of his son, duck-out-of-water New York Times writer Applebome (Dixie Rising, 1996) joins the Boy Scout ranks. They were living in Atlanta when Ben decided he wanted to become a Tiger Scout. 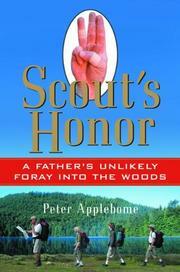 Applebome, a “committed indoorsman” who grew up during an era when the Scouts were hopelessly uncool, if not borderline fascists had misgivings, but he loved his kid, and his kid appeared to love Scouting. So when the family moved north to Chappaqua, New York, Applebome appreciated that joining the Boy Scouts would smooth the transition for Ben. He started to volunteer his time and soon came to respect the fundamental decency and sense of inclusion in the troop, the noncompetitive way it brought kids together. With light, dry wit, he recounts his fumbling attempts to canoe, camp, and hike in winter, while he takes the psychic measure of the boys and adults (“volunteers who do it for various benign, charitable, inscrutable, or suspect reasons”). Applebome is equally concerned with the vices, virtues, and vicissitudes of the Boy Scout organization, so he delves into the backgrounds and worldviews of Robert Baden-Powell, Ernest Thompson Seton, and Daniel Carter Beard; the evolution of the Scout Handbook ethics; the usurpation of the organization by religious and conservative elements; and the recent rulings against gays and atheists. The rights of free association notwithstanding, Applebome finds those rulings counter to the spirit of the Scouts, another example of the disconnect between the national bureaucracy and local troops. In Chappaqua, Scouting is still all about campfires, self- sufficiency, fairness, tolerance, friends, good acts, and fun, with discrimination impossibly remote. “In the end what was admirable and worthy about Scouting seemed far more important than what was stupid and narrow about it,” writes Applebome, though he has a number of suggestions on how to reinvigorate the national organization. A sweet-hearted account of the author’s adventures, as well as a reasoned critique of institutional shortcomings.